'Coloradito' means 'with a little red colour' and is one of the seven famous moles of Oaxaca. 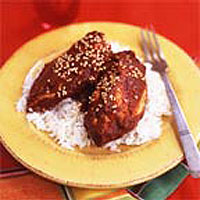 It uses guajillo chillies, which have a sweet refined heat. These are available by mail order from The Cool Chile Company (call 0870 902 1145 or log on to coolchile.co.uk). Bring the chicken stock to the boil in a pan. Add the chicken and 1 tsp salt, bring back to the boil and simmer for 10 minutes. Remove from the heat and leave the chicken in the stock while you prepare the sauce. Slit open the dried chillies and remove the stalks and seeds. Heat a heavy-based frying pan over a medium-high heat and add the chillies. Using a spatula, press the chillies down into the hot pan, until a little smoke appears. Turn over and repeat on the other side. Transfer to a bowl, cover with 500ml hot water and leave to soak for 15-20 minutes. Add the sesame seeds, allspice and cinnamon to the hot pan and stir for a minute or two until the sesame seeds are lightly toasted. Tip the mixture into a spice grinder, or pestle and mortar, add the oregano and grind to a coarse powder. Put the sunflower oil in a large frying pan over a medium heat, add the garlic and onion and fry until beginning to brown (about 10 minutes). Add the bread and banana and continue to fry until the bread has taken on some colour. Transfer to a blender and add the tomatoes, the drained soaked chillies, the ground spices, 1 tsp salt and around 300ml of liquid - either the stock from the chicken or the chilli soaking liquid or a little of both. The sauce should not be runny, but of a consistency to coat the chicken. Press through a sieve into a medium-sized pan, bring to a simmer and cook for 5 minutes, stirring frequently. Lift the chicken pieces out of the stock, add to the sauce and simmer for 10-15 minutes until the chicken is cooked through. Stir in the chocolate. Serve with steamed rice.